At the end of the summer, peaches, nectarines and foraged berries, like blackberries, are sweet and full of flavour. I'm lucky living on the farm, that I can simply step out of my back door and down our lane to pick some 'brambles'. Here in Scotland there are not quite enough ready to make jam or jelly, but there were just the right amount to add to a tray baked cake. It all started with the two egg whites I had left over from another recipe. I didn't want to make a pavlova or meringues, much though I love them. I could have frozen the egg whites for another day, but there was no cake in the tin so my thought was to make a cake and top it with meringue. This recipe is adapted from a plain vanilla tray bake sponge, but I didn't add any milk to the mix as I knew the fruit would add moisture. 1. Heat the oven to 180 C, Gas 4. Grease and line a roasting tin 30 x 22.5 cm. 2. Skin and chop the peaches or nectarines. 3. Place the butter or margarine, flour, baking powder, sugar, eggs and milk together in a large roomy bowl and beat well for about 2 minutes until well blended. Gently fold in the chopped peach or nectarine pieces. 4. Turn the mixture into the tin and smooth the top, press the brambles into the mixture, distributing them evenly across the mixture. 5. Bake for about 35 minutes until the cake has shrunk from the sides of the tin and springs back when pressed in the centre with you fingertips. Don't let it get too dark as you will be returning it to the oven. 6. Turn the oven down to 160C, Gas 3. 7. Place the egg whites in a bowl and beat with an electric mixer until they form soft peaks. Add the sugar a spoon at a time whisking well until all the sugar has been used. 8. Spread the meringue over the cake and bake for 10 minutes until the meringue is firm to the touch and pale golden brown. 9. Leave to cool in the tin and when cold, cut into squares. The cake is moist and delicious with the sweet fruit pieces adding a soft lusciousness and the meringue a light crispy texture. You can make the cake without the meringue and it would be almost as good, but the meringue really enhances it. 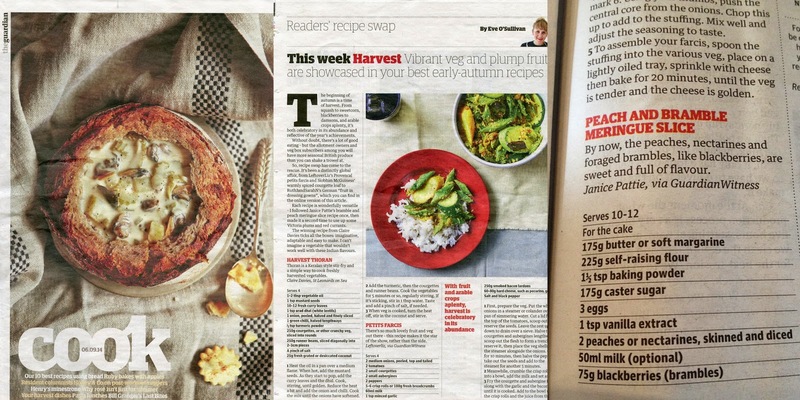 I submitted this recipe to The Guardian Cook - Reader's Recipe Swap and was thrilled when it was accepted and published. What a lovely bake. I love the addition of the meringue topping - delicious! Lovely photo Janice. Sounds delicious with blackberries and meringue - it reminds me of my mother's Queen of Puddings. Looks delicious, and the meringue topping is so innovative! For some reason I never thought to put those fruits together, but now I think about it they would go well together. Not only is the cake amazing, but I LOVE the photo! I'm salivating over my keyboard! Thank you, the meringue worked really well. Thanks Janine, yes they do go well together. Thank you Christina, I've been doing an online Food Photography course and have learned so much. Thank you Deena, it's a nice easy cake to make and I am working hard to get good photos. That looks and sounds delicious, Lovely photo too. I love fresh peaches and they are in their element at this time of the year. Glad you put them in your cake. 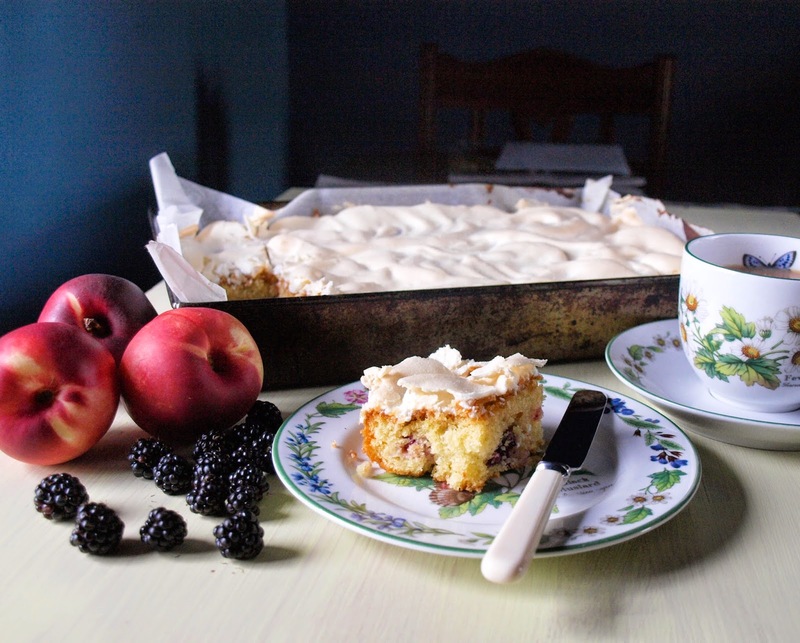 A lovely way to use up fruit that you've picked yourself - the meringue topping on a cake is really interesting too, I might have to try it! Thanks for entering Alphabakes. Thanks Caroline, it's good to be able to enter again.